Back in July I reported that Ghostbusters 3 was in the works with Judd Apatow producing a sequel that could see many of his stars like Seth Rogen, Jonah Hill and others become new recruits on the Ghostbusters team. Many news outlets reported this as rumors, but I stuck to my guns knowing that Hollywood would not pass up this idea! I well my friends, I was right! Take that, all of you who doubted! It seems Harold Ramis has confirmed the internet rumors in an email to the Chicago Tribune. Ramis had this to say, "Yes, Columbia is developing a script for GB3 with my year one writing partners, Gene Stupnitsky and Lee Eisenberg. Judd Apatow is co-producing year one and has made several other films for Sony, so of course the studio is hoping to tap into some of the same acting talent." 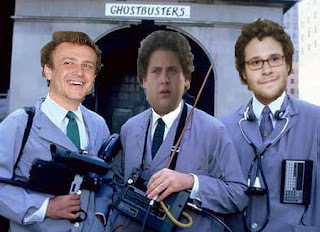 Back in August, when Seth Rogen said the idea of Ghostbusters 3 sounded, "Rad," I knew this project would move forward and Ramis has obviously confirmed those rumors. 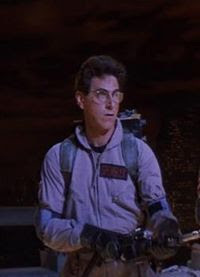 Harold Ramis went on to say how exactly the original team would be involved in the new film, "Aykroyd, Ivan Reitman and I are consulting at this point, and according to Dan, Bill Murray is willing to be involved on some level. He did record his dialogue for the new ghostbusters video game, as did Danny and I, and Ernie Hudson. The concept is that the old ghostbusters would appear in the film in some mentor capacity. Not much else to say at this point. Everyone is confident a decent script can be written and I guess we'll take it from there." Awesome! I love the original Ghostbusters films and have loved what Judd Apatow and Company have done so far, so this sounds like a great project. No word on which of Apatow's highly sought after cast will appear in the newest of the series. Rumors can swirl as to which of Apatow's crew will actually make it. Here's my take; Seth Rogen is a shoe-in! Rogen has starred in the most of Apatow's features and would be a perfect Murray-esque character. Jonah Hill seems like a perfect fit for a new Aykroyd or Ramis type character. Craig Robinson seems like he could fill Ernie Hudson's personna and either Jason Segel or Paul Rudd would be a perfect as the last member of the team. 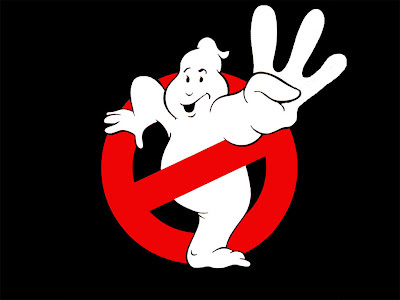 What are your thoughts on Ghostbusters 3? Does the idea of Apatow's crew replacing the original team sound like a good thing? Who would you cast as the year one rookies?